and this maxim has been my good friend for a long time. But sometimes the stupidity is too acute to be plausible. Surely stupidity has limits? Here's a case that left me gobsmacked. For the last few years, airport security checks have been confiscating any liquid that is over 150ml or is not in a clear container. This is due to a security scare at some time. Fair enough, I accept that. It turns out that they are also confiscating items purchased in-transit -- perfumes and duty free liquor, for example. I accept this too: I mean it's stupid, but it's within the usual bounds of plausible stupidity that we encounter every day. It's been going on for a few years now. But here's the case of implausible stupidity I encountered last week at Syndey airport. There's a duty free store encountered in-transit, just before a blind corner, at which there is an unexpected security check point. So a store is selling items to people who will be forced, just 10 metres down the road, to relinquish their purchases. 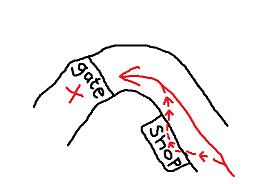 A duty free store sells goods just before a blind corner. You walk around the blind corner and you enter a small, fast moving security check point. Once your liquid goods have passed through the x-ray machine, they are confiscated. Everyone looks surprised. Even the security guards act like this has never happened before. For many of the victims of this situations, this is their very first experience of Australia. Some kind of a crazy country where everyone is out to trick you. I am pretty sure there's some organised crime occuring here, because the alternative explanation, stupidity, is just too impossible to be believed. The shop should inform the in-transit passengers that their liquor will be confiscated, before making the purchase. The checkpoint could allow the passengers to return to the shop and demand a refund on the sale of the liquor. The airline could warn the in-transit passengers (before they leave the plane) that any liquor they purchase in transit will be confiscated. Instead of issuing the actual liquor, issue some kind of voucher which the person can use to collect the liquor at a final destination. Respect the shop's tamper-proof packaging, as this ought to indicate that the goods are safe for travel. (If need be, an upgraded form of tamper proofing would be sufficient). But what's really going on here? What do you think happens to all that liquor? I sincerely hope that there's a racket of some sort. Maybe it gets sold back to the shop. Maybe the security guards hang onto it. I'm not sure, but I just hope there's a profitable crime going on, because in such a blatant case, malice is far more understandable than stupidity. Sorry for the hiatus. Have been on holiday.